IHS Cera and World Economic Forum published a Report on Energy Vision: Past and Future, that helps understand today’s important era of energy transition. Considering all the external and internal factors influencing the incumbents” strategies today, for ex. climate change, technology advancement, price volatility, resource depletion etc., the report educates the global society about the entire mix of energy resources, the increasing role of coal and natural gas due to demand from emerging markets as well as renewables that totalled US$184 billion revenue in 2012. There are two main factors that create imbalances and have consequences for all participants in the world’s energy industry. 1) Climate change and the traction of carbon policy: reflected in EU 2020 goals, China’s 12th 5-year Plan, US Department of Energy prediction of 80% US electricity to be renewed by 2050. 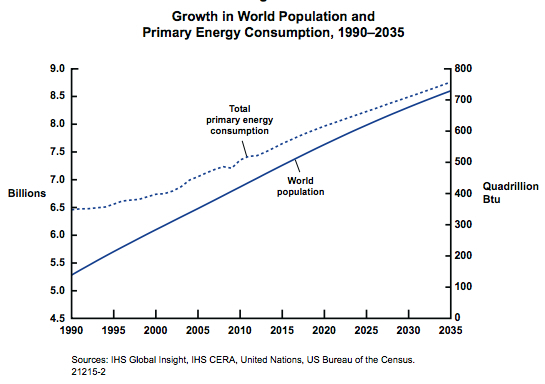 2) Concern that the current energy mix will not meet the rapidly growing energy needs of emerging market nations. So, what is today’s situation with the Energy mix and will it meet our expectations? 87% of total world primary energy demand is met by three hydrocarbons – oil, coal and natural gas. With nuclear it adds up to 92%, and wind solar, geothermal and other non-hydro renewable resources provide just 1.6% of total world energy. Since 2000, world energy consumption has increased 27% with coal’s share changing the most, increasing from 23% in 2000 to 28% today; oil dropping from 36% to 32% and renewables have doubled, from 0.6% to 1.1% with wind power and solar as the leading energy resources. 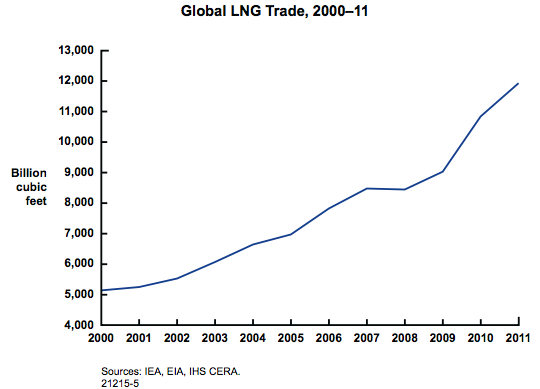 Natural gas holds a 21% share of the primary energy mix and as expected by IEA, LNG trade is expected to double by 50% by 2020. With regards to expectations, it is important to realize that the global society should concern not only about the outcome, i.e. whether expectations are going to be met or not, but whether they are met responsibly. It means with consideration how environmentally friendly is the exploitation of resources. As mentioned by Vaclav Smil, Distinguished Professor Emeritus, University of Manitoba, Canada, “The most important historical lesson is that new resources require extended periods of development”. “…Comparing our aspirational goals of renewable energy deployment (30% of electricity from wind by 2030 etc.) with realistic aims and considering the historical fact that while the contributions of wind and solar PV more than tripled during that decade, the world is now more dependent on fossil-fuelled generation that it was in 2000. Mr. Smil suggests that this is reality that will not change rapidly. Thus, keeping this in mind and with urge to meet global energy demand in environmentally responsible way, I assume the global society needs to change its energy consumption culture, i.e. to research and educate next generations not only to use available energy and power sources responsibly, but also to consume less energy while keeping the same lifestyle. However, it might be not easily achieved, because in order to have a sustainable global economy we need to face the energy demand of emerging economies. According to IEA India’s power sector will triple in size by 2035, China’s 12th 5-Year Plan (2011-2015) points to significant gas-fired power additions with a plan to increase the share of natural gas in China’s energy mix from 4% to 10% by 2020. MENA’s power demand will also grow because of the rise of living standards and growing young populations. So, how will the energy mix look two decades from now? As suggested by Christof Ruhl, Group Chief Economist and Vice President, BP, UK, there will be no dominant fuel in future. “Not only are oil, coal and gas likely to remain the most important fuels over the next 20 years; their market shares are likely to roughly equalize, at 25% to 30% each. This would be the first time that the world has not been dominated by one single fuel.”. 2. Economies of Scale: to achieve the sufficient economies of scale, government incentives and subsidies are necessary in order to promote innovation, enable companies to go up the learning curve and lad the prices that are competitive. 3. Price cap: governments might regulate the price by putting a price on carbon directly or through a trading system, or through the shadow pricing of government mandates. An important role is played by Efficiency which is a means to deal with all three goals of energy policy-makers – inexpensive, secure, low-carbon energy. “Motainai” – the japanese word means “too precious to waste” and reflects that the most secure and low-carbon form of energy is not using energy at all. – while electric power plants use oil, coal and other fossil fuels to crate electricity only 40$ is converted into electricity while 60% of the energy is wasted. – At nuclear power plants, 70% of energy is dumped into the ocean as thermal discharge. – In 2012 Japan spent 23 trillion Yen (approximately U$300 billion) importing fossil fuels and roughly 30% was used to create electricity. Information technology, technology advancement such as f or ex., cogeneration as well as subsidy reforms contribute to efficiency improvements shifting the energy economy, particularly in developing countries. The Energy Vision report presents also the World Energy Timeline by Daniel Yergin, The Quest: Energy, Security and the Remarking of the Modern World, 2012., that reflects the main milestones of global growth and energy industry. Energy Vision 2013: Past and Future reveals more detailed information about many aspects influencing energy mix and transition.